Install hooeey webprint IE Add-on Follow installation wizard instructions. Restart browser. To install hooeey webprint for both Firefox and Internet Explorer, please follow the steps for Internet Explorer. In your browser, you should be able to see the hooeey webprint icon in the toolbar area. All browsers must be closed when you install hooeey webprint plug-in. If you do not see the hooeey webprint icon in your browser, locate the hooeey webprint icon on your desktop or in the Program (Windows) or Applications Folder (Mac) and (double)-click to open hooeey webprint. 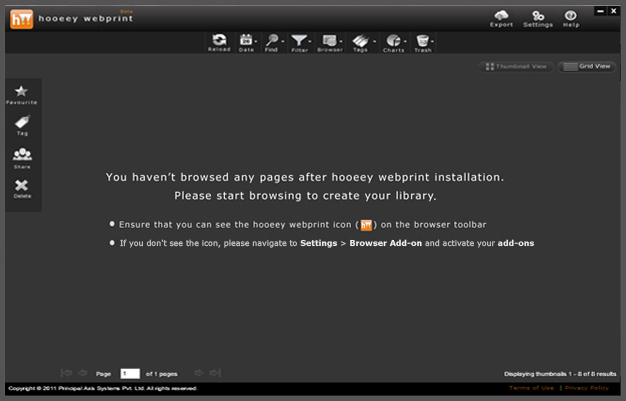 All browsers must be closed when you install hooeey webprint add-on. © 2011 PRINCIPAL AXIS SYSTEMS PVT LTD (hooeeywebprint.com). All rights reserved.